Jeff Bridgman Antique Flags and Painted Furniture - A MASTERPIECE AMONG KNOWN EXAMPLES: AMAZINGLY GRAPHIC FLAG WITH 37 SIX-POINTED STARS IN A SPECTACULAR DOUBLE-WREATH STYLE MEDALLION, POSSIBLY WITH A PRO-UNION MESSAGE, INSCRIBED WITH THE INTIALS "A.P." AND THE NAME "PURSEL"
A MASTERPIECE AMONG KNOWN EXAMPLES: AMAZINGLY GRAPHIC FLAG WITH 37 SIX-POINTED STARS IN A SPECTACULAR DOUBLE-WREATH STYLE MEDALLION, POSSIBLY WITH A PRO-UNION MESSAGE, INSCRIBED WITH THE INTIALS "A.P." 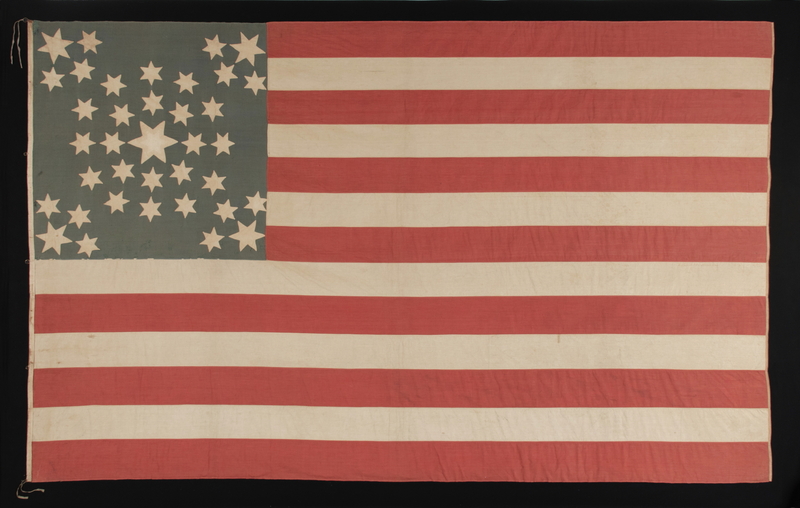 AND THE NAME "PURSEL"
Flag Size (H x L): 68.25" x 108.5"
37 star American national flag with its stars arranged in a configuration that falls among the best that I have ever encountered on a 19th century example. This consists of a dynamic double-wreath style medallion that incorporates three sizes of stars, each of which has six points. Like many medallion patterns, the focal point is a large center star, surrounded by consecutive rings. In this case these consist of 8 and 12 stars respectively. Most are then flanked by a single star in each corner. This one, however, exhibits groups of 4. Each of these has a large star (though smaller than the central one) at the furthest point, corralled on the interior by an arch of 3 stars. When this elaborate design is executed with six-pointed stars, the result is not unlike an elaborately exploding firework, with an impressive visual impact. 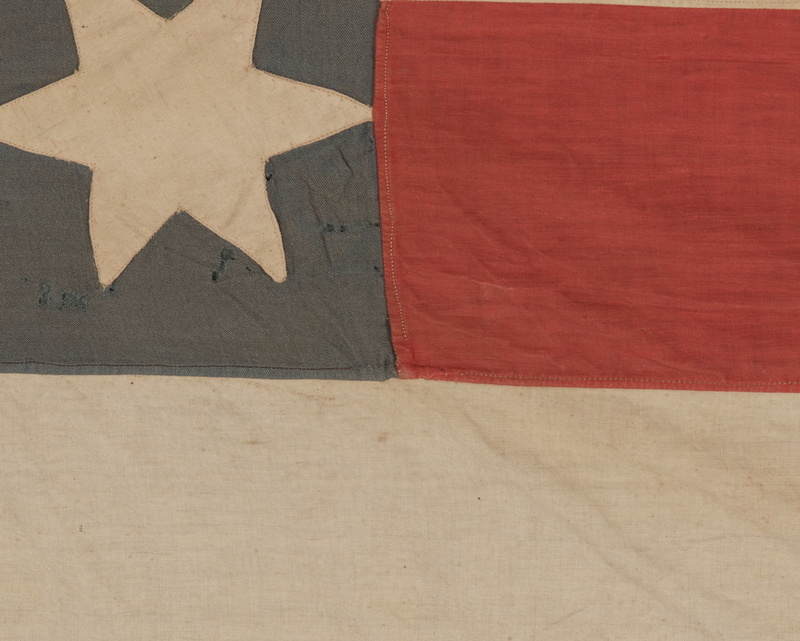 From a folk art perspective, the flag excels, but it also begs interest from a historical one. 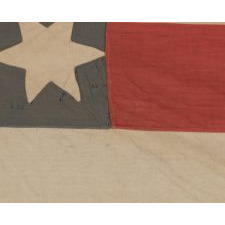 Just as there was no official configuration for the stars on the American flag until 1912, there was likewise no official format for the stars themselves, which could appear with any number of points. Even so, the distribution of flags made prior to that year that have stars with greater or fewer than five points is far less than one percent—maybe one in one thousand. No one knows for sure if the six-pointed design seen here had any religious connotation, but it could be that the pattern may have been selected by a flag-maker of Jewish faith, to represent the six-armed Star of David. A great deal of hidden symbolism exits in flags of the 19th century and this is especially true with regard to those made in and around the Civil War (1861-65), when all manner of beliefs regarding religion, nationality and heritage came into sharper focus with the associated emotional impacts. While the star configuration may be purely decorative, the decision to place 21 stars at the flag's central core and 16 stars disjoined around it, could reflect pro-Union sentiments. At the close of the Civil War there were 16 states that were generally in support of the Confederacy, including the 11 that formally seceded, plus the 5 Border States. The latter of these comprised the balance of the 15 Slave States, while the last, West Virginia, broke off from Virginia in 1863 and became a Free State, yet moreover supported the South. Nebraska joined the Union as the 37th state on March 1st, 1867, shortly following Lincoln’s death and the close of the Civil War. 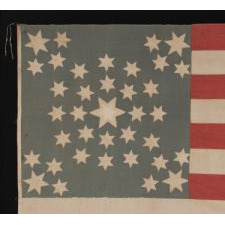 The 37 star flag became official on July 4th, 1867 and remained so for the majority of Reconstruction, which ended in 1876. Strong feelings about loyalties to one side or the other were rampant well into the 20th century. At this early date they could scarcely be stronger, as families reeled from the emotional and financial strains of the most costly war ever fought on American soil. This could explain the distribution of stars, though their numbers may of course be purely coincidental, merely reflecting the flak-maker's artistic preference. Whatever the case may be, the selection is noteworthy and the graphic impact substantial. From the surviving number of 37 star flags, it seems obvious that fewer flag-makers chose the official, 37 star count for centennial festivities. But some did, as evidenced by datable examples. While undated, 1876 manufacture seems a distinct possibility in the case of this particular flag, if simply because the centennial brought forth a myriad of interesting designs. 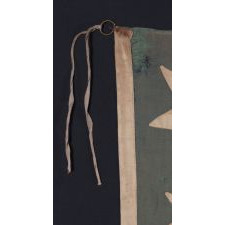 Flags made between the war's close and 1876 tend to be less interesting from a graphic perspective, while the patriotism of the Civil War and the centennial brought forth an abundance of creativity. Evidence of another star shaped piece of fabric, formerly appliquéd at the very center of the centermost star, and in relatively the same size as the smaller stars around it, might have been added to reflect Colorado statehood, either before or after the date it took place. The precise reason for its addition and subsequent extraction, however, is difficult to speculate. The initials "A.P." 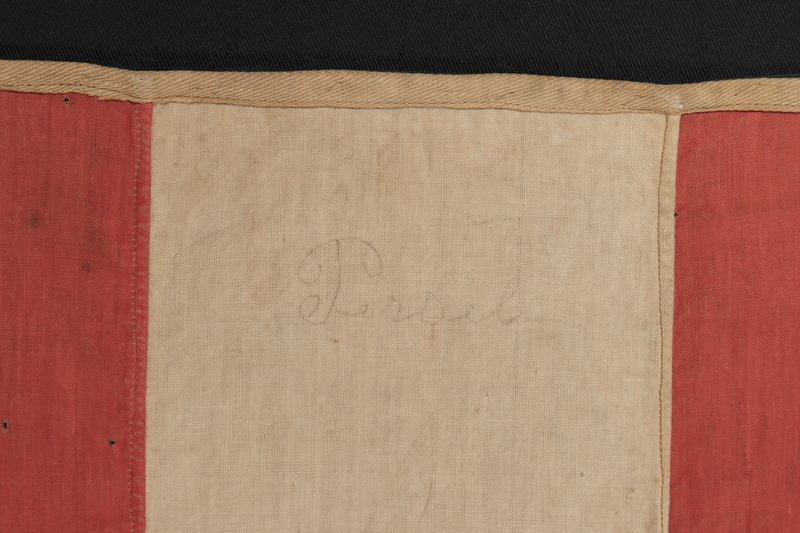 are penciled along the hoist binding, adjacent to the canton, and the name "Persel" is inscribed vertically in one of the white stripes, adjacent to the fly end. 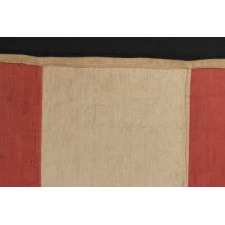 It was common to mark flags in this fashion during the 19th and early 20th centuries to indicate ownership. Three men by this surname, with this spelling, are recorded as having served during the Civil War, two of whom survived it. George W. Persel (no residence listed) mustered into Company "G" of the 20th Ohio as a Private on May 5th, 1861, serving just three months. Robert Persel of Columbia County mustered into Company "E" of the 209th Pennsylvania as a Private on September 9th, 1864 and served until May 31st, 1865. But neither had the first initial "A." Many spelling errors were made regarding enlistment, however, and fourteen men served with the name Persell, plus one by the name of Persels. Among these nine survived the war and two were officers. Alexander S. Persell (no residence listed) mustered into Company "C" of the 122nd Ohio as a Corporal on August 22nd, 1862 at the age of 31. He made Sergeant on April 15th, 1865 and mustered out on June 26th of that year. He is the only one with any of the three spelling variations that has the correct first initial to match, and seems, by way of rank and involvement to be the most likely owner. While none of these soldiers may have, in fact, owned the flag, prolific use of the flag by veterans and their families is always more likely. Examination of their list is especially prudent here, given that all three spellings are unusual, comprising just 18 of the 2,213,363 men who served the Union Army just prior to the flag's manufacture. The size of the flag is impressive but manageable. 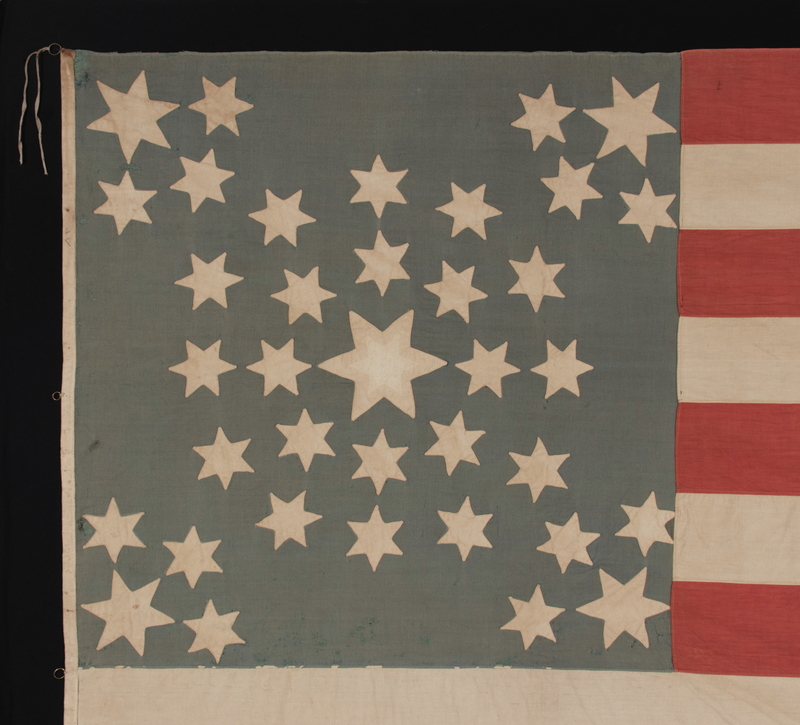 During the 19th century, very few flags with pieced-and-sewn construction were made in the sizes we find common today. 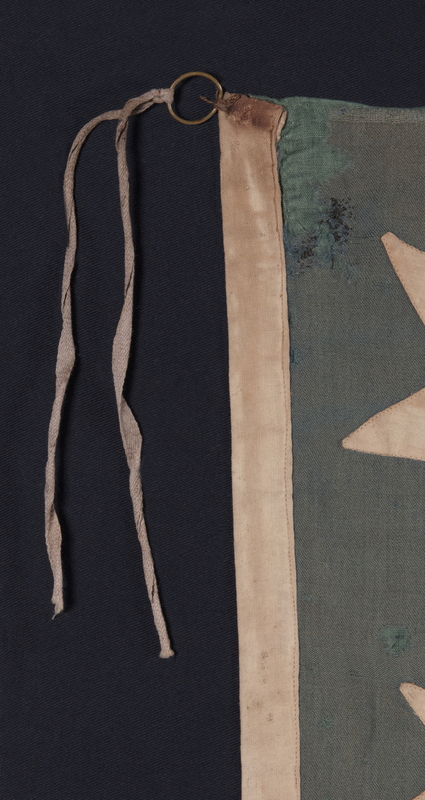 Prior to 1890, sewn flags were typically 8 feet long and larger on the fly. Garrison flags were usually between 35 and 45 feet. A 6 foot flag was considered small. At a full 9 feet on the fly, this large scale textile is typical of its time in that regard. Flags needed to be large in order to serve their purpose as signals. Even decorative flags, such as this one, were large by tradition. All-in-all a marvelous example of the period. 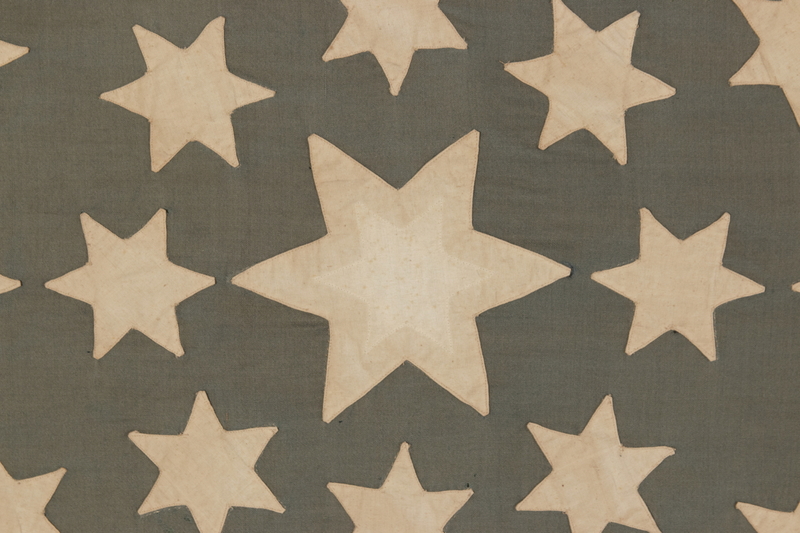 Construction: The stars of the flag are made of cotton and double-appliquéd (meaning that they were applied to both sides) with treadle stitching. The canton is made of merino wool and the stripes are made of plain weave cotton, all of which were pieced and sewn by treadle stitching. Note how the color of the canton has faded to an attractive shade of sea foam blue-green. This is less likely a function of exposure to light than it is to the dye having had a fugitive quality. There is a narrow cotton binding along the hoist, along which a series of five small brass rings were stitched so that the flag could be tied to a wooden staff. Lengths of flat cotton cord, perhaps once shoe laces, are looped and tied at the top and bottommost rings. There is a twill cotton tape binding along the fly end. This is an unusual feature that I always like to see, not only because of its scarcity, but even more so because of its positive visual qualities. 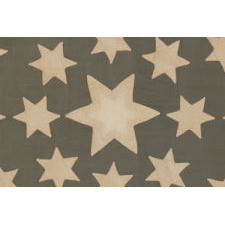 Mounting: The flag has been hand-stitched to 100% silk organza for support on ever seam and throughout the star field. It was then hand-stitched to a background of 100% cotton twill, black in color. The black fabric was washed to reduce excess dye. An acid-free agent was added to the wash to further set the dye and the fabric was heat-treated for the same purpose. The flag is not framed, but this mount prepares the flag for framing. Condition: There is very minor mothing in the canton, accompanied by wear from use in the extreme upper, hoist-end corner. The canton has experienced moderate to significant fading, but eh resulting color is especially intriguing. There are very minor holes and losses elsewhere and there is very minor soiling and oxidation. In these regards the flag survives in an excellent state of preservation, especially given its size and cotton construction. Many of my clients prefer early flags to show their age and history of use. 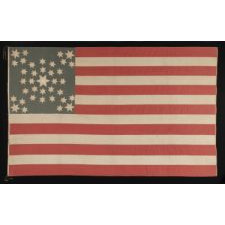 As the nation's largest seller of early Stars & Stripes and political textiles, antique American flags are my foremost business. As a serious collector and dealer of 19th century paint-decorated furniture, folk art and textiles, American Fancy is my foremost love. As a American patriot, the convergence of these closely related fields has led to a life-long pursuit of the most colorful, rare, and magnificent examples. I hope you enjoy the pages herein. Powered by Esvon Classifieds software. The makers of powerful Classified scripts solutions. Copyright © 2014, Esvon LTD. All rights reserved.